Mini-confession here: I am slightly obsessed over printables, specifically kids' printable activities. Ok, not really obsessed-obsessed, but more like I-am-a-HUGE-fan-obsessed. You see, we've had a lot of sickness going on in our household over the past 3 months or so. (It's a really long story. I'll spare you the details, but we've been through lots of probiotics, Emergen-C, and other stuff. I'm pretty sure we're on the up-swing now.) Basically, what I'm saying is that we've had a rough season, as far as our health is concerned. (We're getting better, though). There have been so many days where I was sick or everybody was sick and I needed a quick activity to keep the boys entertained while I laid on the couch and blew my nose. I had days where Mac was quarantined in his room and was in need of a quiet activity to keep him entertained while he recovered from another cold. 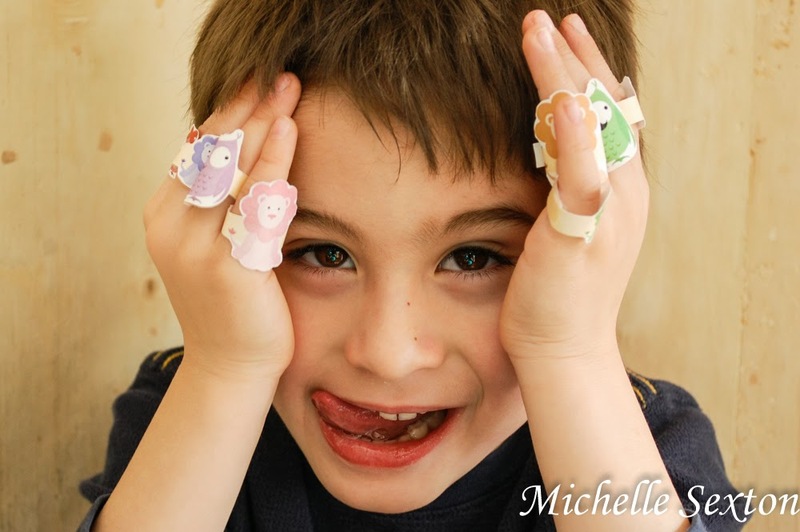 During these moments, I have realized that printable kids activities are a mom's best resource. It's been so nice to print out an activity on a sheet of paper and allow it to entertain my boys. Amazing...and oh-so-easy. So, today I bring you yet another printable kids' activity. I know...I've been making a lot of these lately, but there's just so much to like about them. 1. They're FREE. 2. The kids are enthusiastic about a new activity 3. When they're done, you can toss it in the recycling bin (easy clean up) and 4. It's EASY! 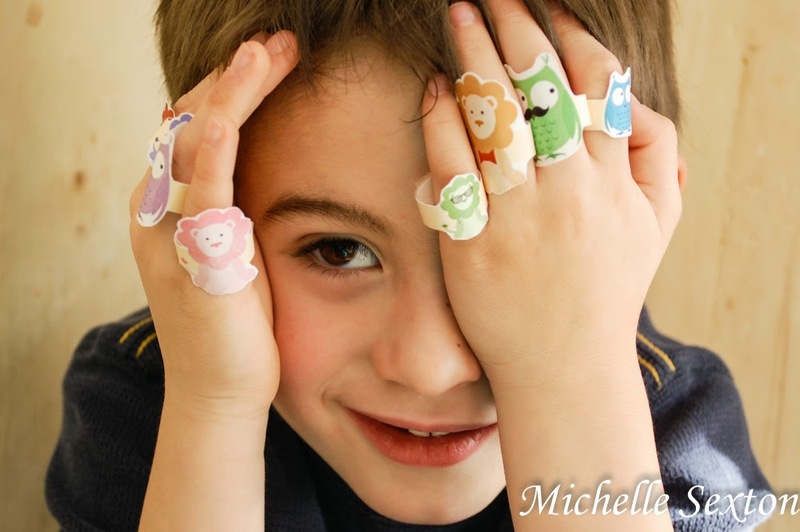 Seriously, what is there not to like about printable kids' activities? 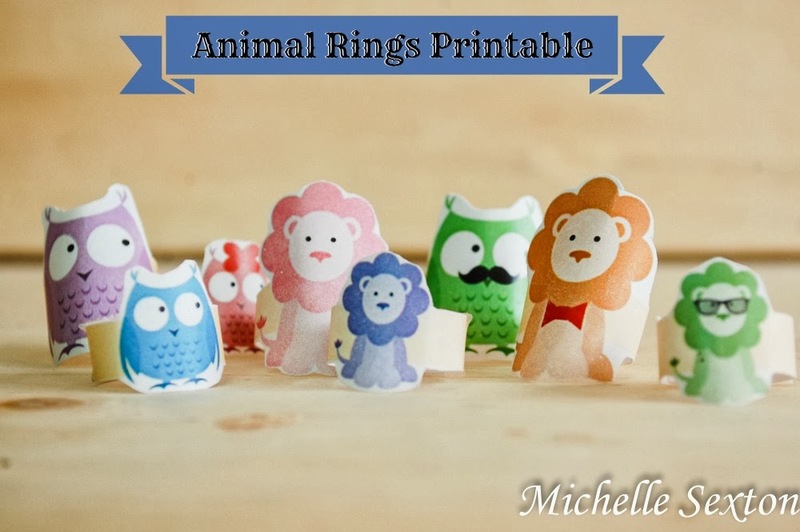 Yesterday, we printed and cut out these fun little animal rings and spent quite a while playing with them. Today, at lunch Cheese sat in his high chair and played with one of the rings while I made his lunch. (This is actually a pretty amazing accomplishment, due to the fact that he assumes he will immediately be fed once he is seated in the high chair. #foodie - oh wait...can you use hashtags on a blog? Just Kidding.) So anyway, these rings have been a big hit in our house and have been unintentionally dispersed throughout the rest of the house, because the boys have played with them continuously. If your kids are anything like mine, they will love them. 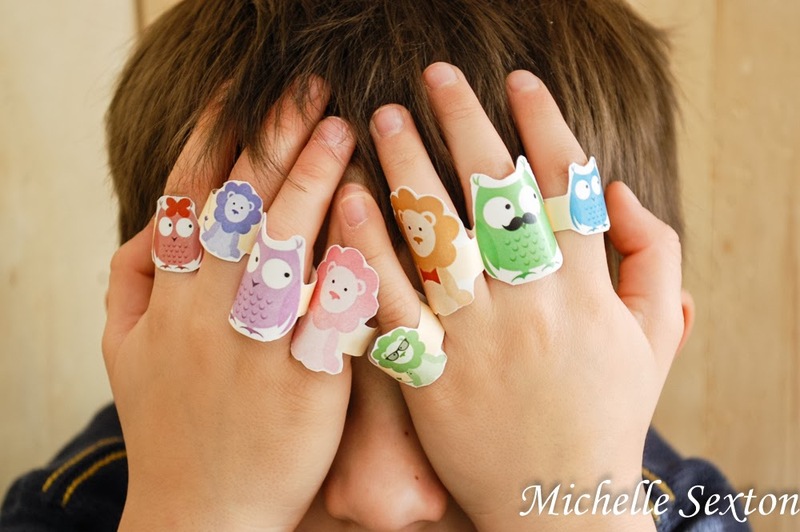 Get the animal rings right here! I recommend printing these rings on card stock. After printing, cut the rings out and tape the ends together to make each ring. 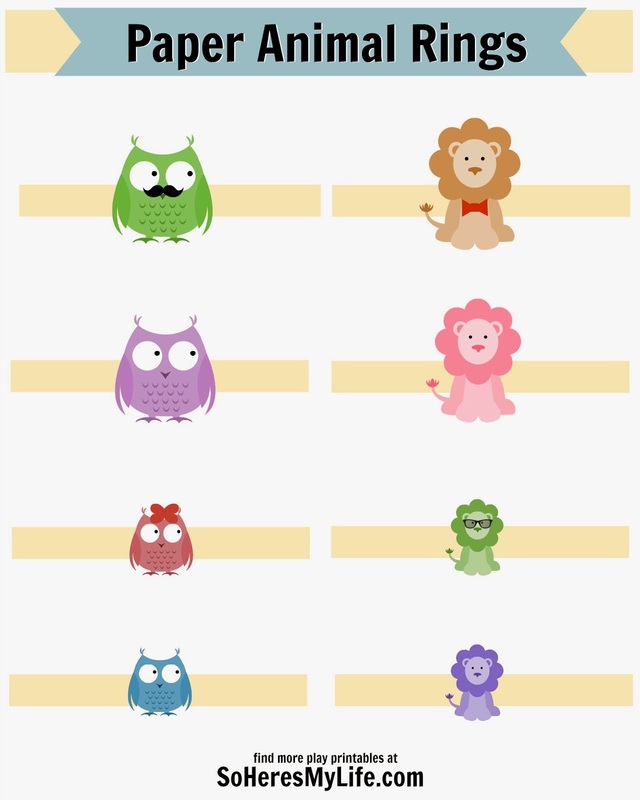 Interested in more printable kids' activities? Check out the Silly Shape Finger Puppets, Miniature Jack-in-the-box, Printable Roads, and the Printable Train Tracks. Recipe Alert! I have a good one for you guys today. In fact, the last time I made this everyone at the dinner table was completely silent - not because like my food poisoned them or anything, but because it was AWESOME. Oh, yes it was. All four of us were so consumed by the amazing flavor combinations of this dish, that nobody was willing to speak, not even for a moment (even Mac, which never happens, because he will do anything to get out of eating his food - usually by talking). None of us could bear the thought of sacrificing a even a moment for words. What is this recipe, you ask? 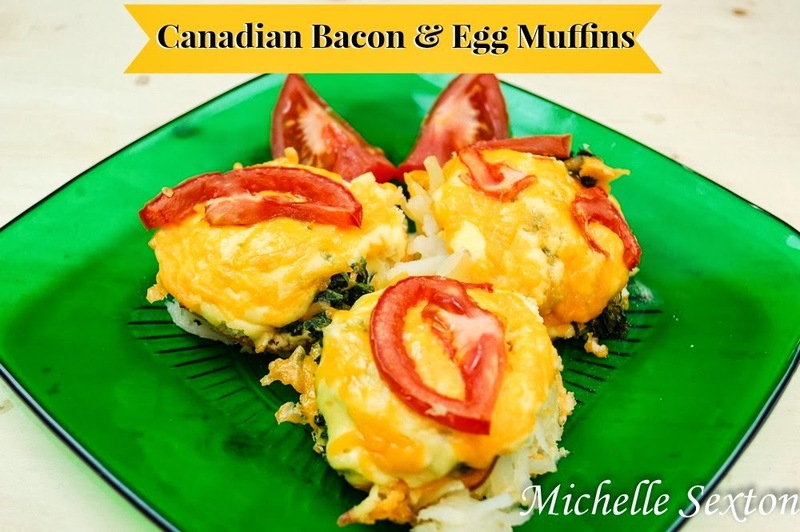 Well, let me tell you, Canadian Bacon and Egg Muffins. Although, it's no much of a muffin, but maybe more like a cup. 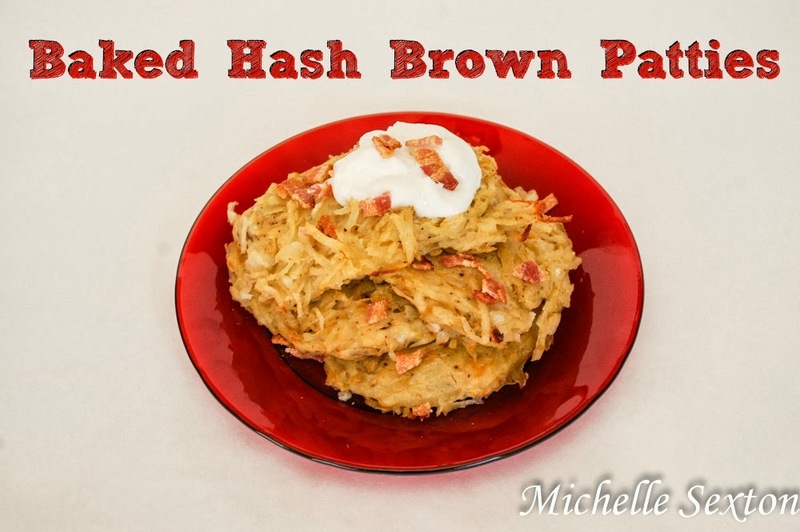 There is no bread in this recipe, we use hash browns instead...and they are awesome. 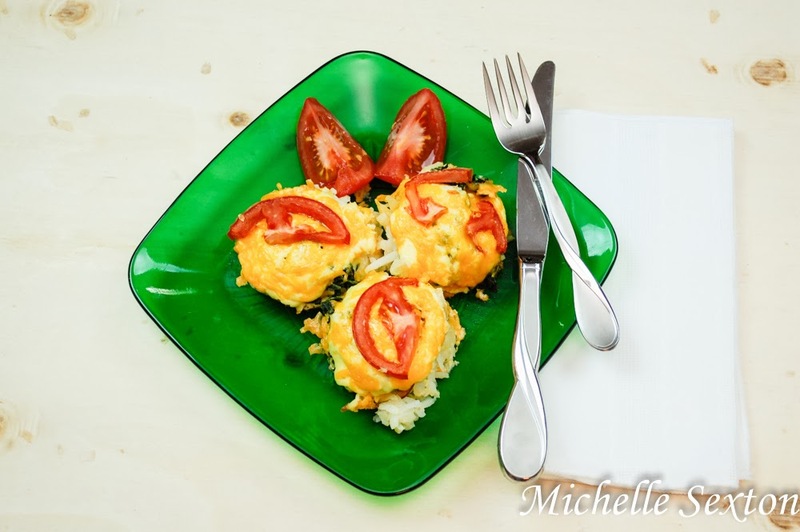 In a microwave safe bowl, combine thawed hash browns and green onions. Cover bowl with plastic wrap and microwave for 2 minutes or until potatoes are tender. Put in colander to drain. While potatoes are cooking, squeeze spinach dry. In a small bowl, combine ricotta cheese and eggs. Spray a 12 muffin tin with cooking spray. Distribute potatoes evenly in the bottom of each tin (start with 1/4 cup per tin). Top with a quarter-slice of bacon, 1 heaping teaspoon of ricotta cheese mixture, 2 tablespoons of spinach, a table spoon of cheddar cheese, another bacon quarter, and another heaping teaspoon of ricotta mixture. Sprinkle tops with a few remaining shreds of cheese and 2 tablespoons of the seeded, sliced tomatoes. Bake muffins until fully set and ricotta is cooked through, about 25-30 minutes. Cool in muffin tins for about 10 to 15 minutes before removing. Makes 12 muffins. Serve, eat, and enjoy the silence while your family consumes this tasty meal. Can't get enough hash browns? 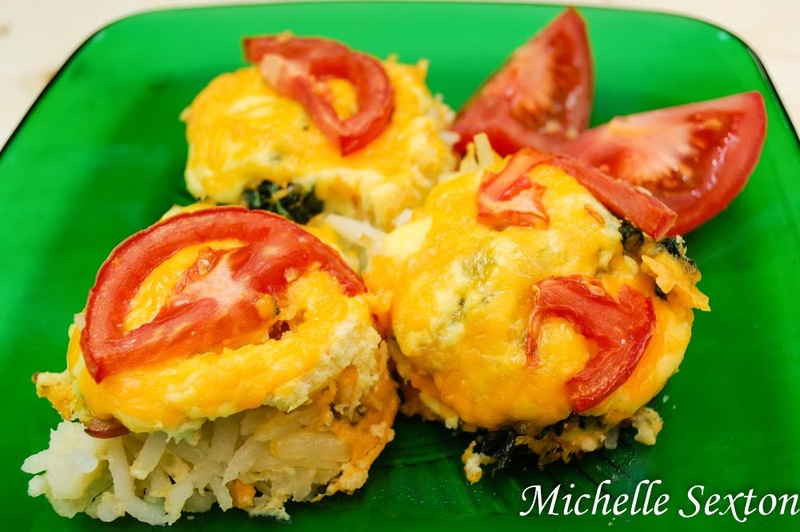 Try these Baked Hash Brown Patties too! I came across this recipe at Shrinking on a Budget. If you haven't checked out this site, I highly recommend it. Bam that's it! Don't you love it when there's only a couple of items needed for a project? I do. - Double thread the needle, just to keep each bead extra secure. 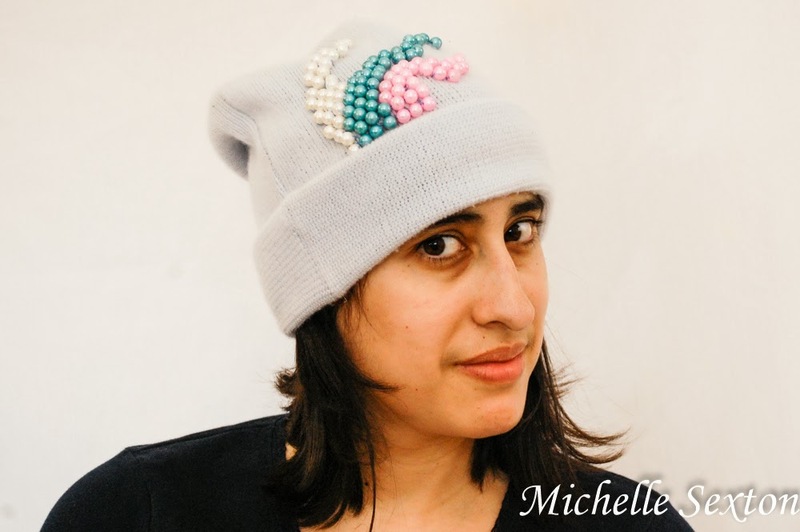 - Stitch each bead to the hat three times before tying it off and moving onto the next. 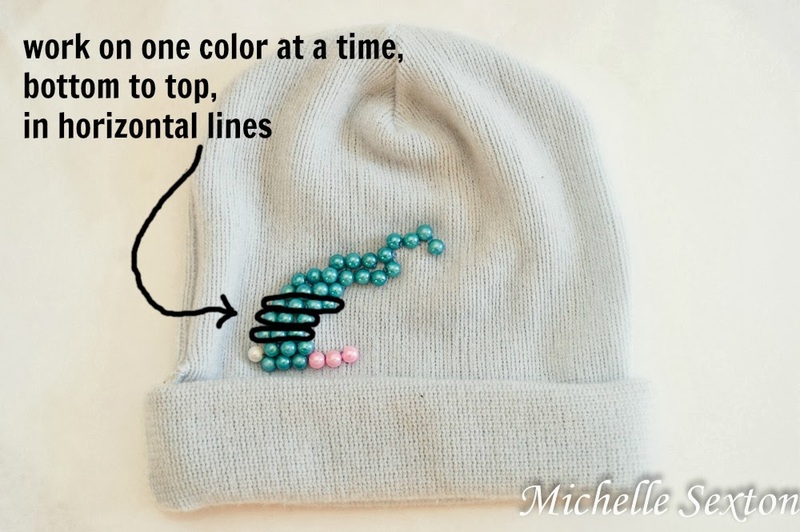 - Knot each individual bead to the hat separately, even if you don't cut the thread after each bead. This will keep you bead loss to a minimum if the beads get caught on something. 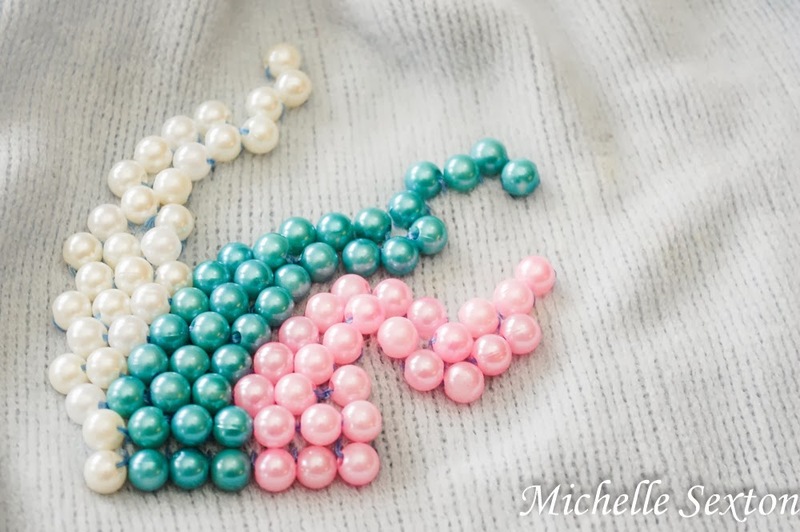 Start out by stitching the entire bottom row of beads (all three colors), just above the brim. 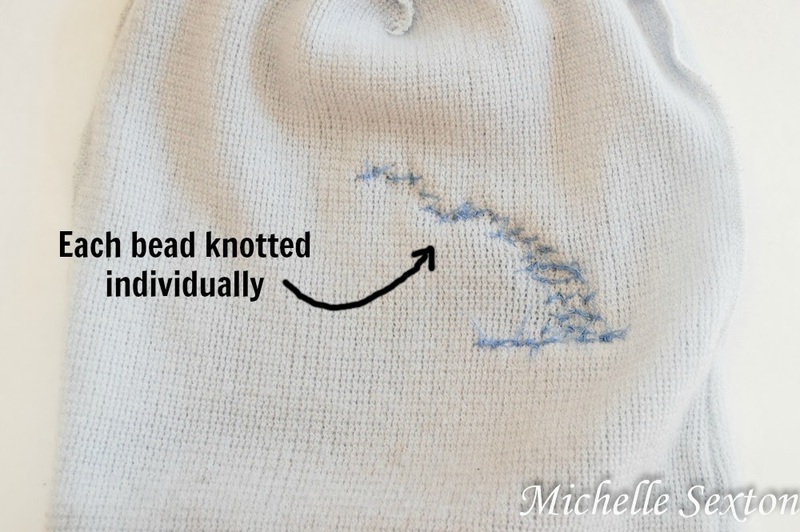 I recommend marking each spot with chalk where each bead is to be sewn. (I didn't do this, but only because I didn't think about it until afterwards. Duh.) The bottom row will give you a foundation to work off of. Once the bottom row has been completed, continue by stitching the center color (mine was blue), working your way from bottom to top, horizontal row by horizontal row, until the entire color section has been completed. Be sure to reference your "prearranged" picture every so often to keep track of the progress. 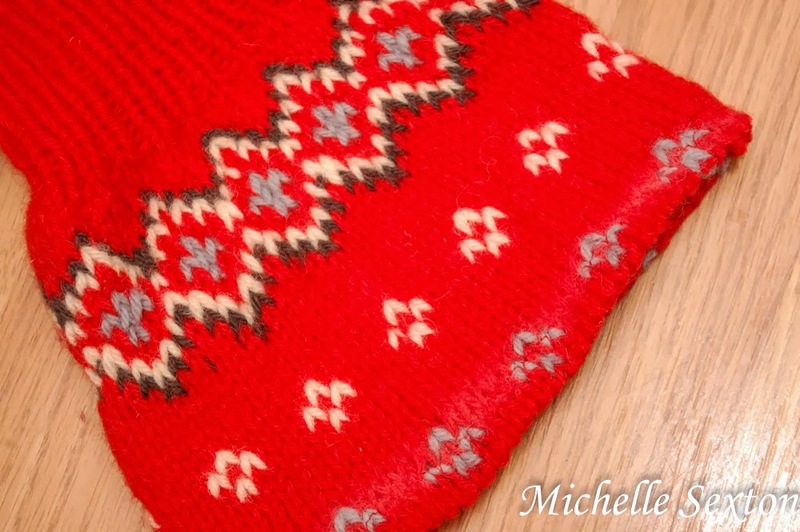 After completing the center color, continue with the next color (either side is fine). Again, work your way up to the top, completing one horizontal row at a time. Repeat again with the final color. Simple? Definitely. The hardest part of this project was finding uninterrupted time to sit down and work on it, which rarely occurs before 7:30 PM. Life of a mom, right? Have you had your fill of winter yet? Has Snowmageddon depleted your creative energy? Well, guess what? 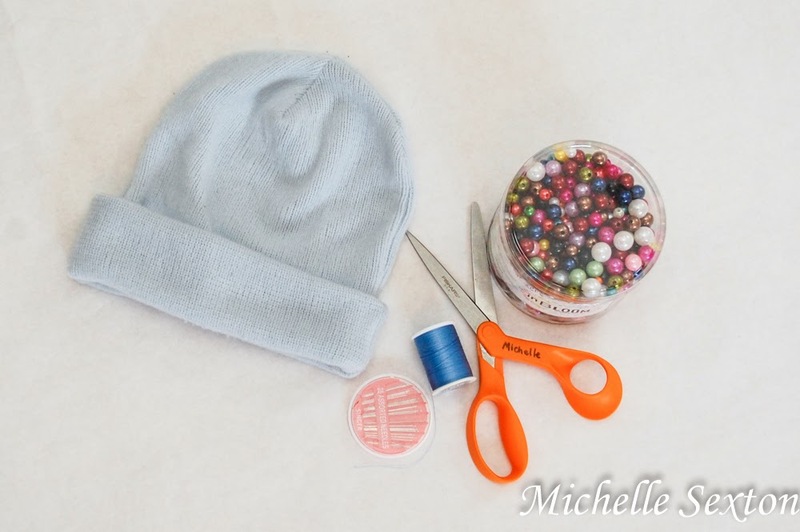 Here's an unexpected and easy sewing project to make for your little ones in one evening. 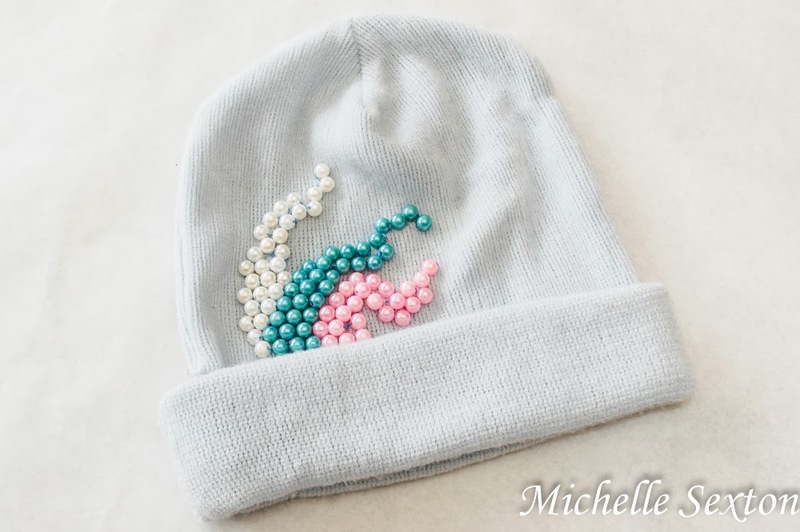 This easy little project may just make these last days of winter a little more bearable, once you see your little ones wearing these cute little beanies on their heads. 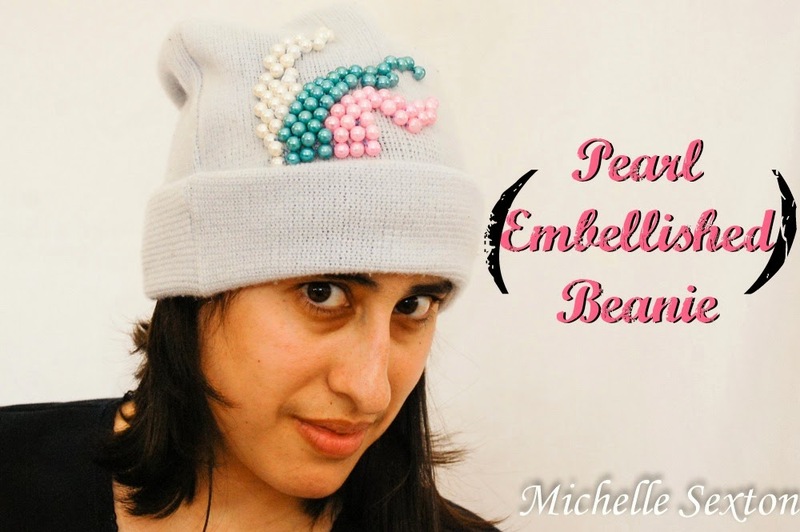 These beanies were made with the leftover material from an upcycled sweater project that I shared a couple of weeks ago. 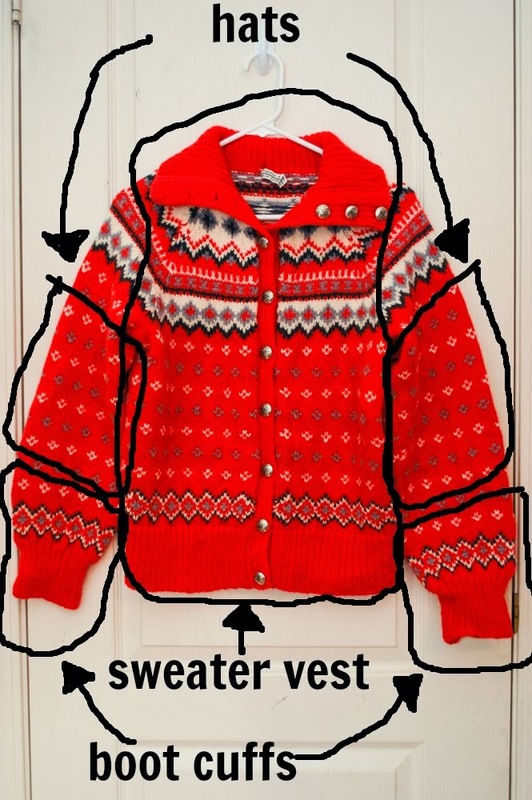 The sweater originally had gigantic baggy sleeves that proclaimed, "I'm so outdated!" They just had to go. 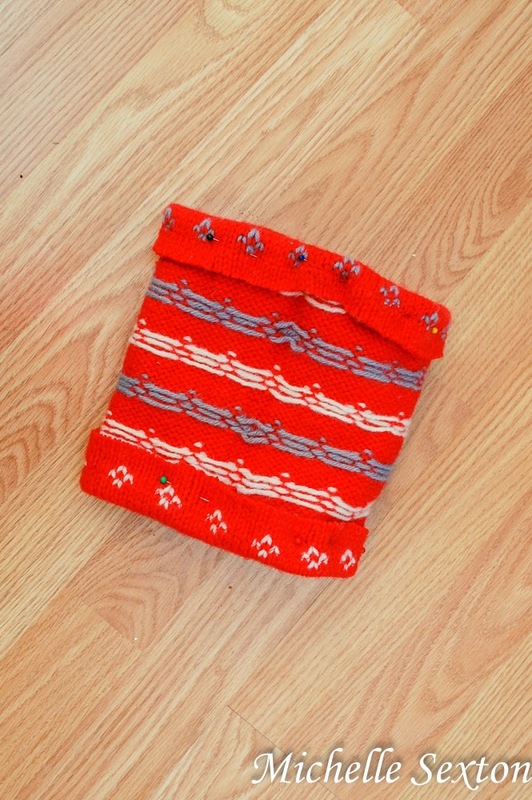 So, I cut them off and made a cute pair of boot cuffs, and still had a bit of leftover sleeve material. 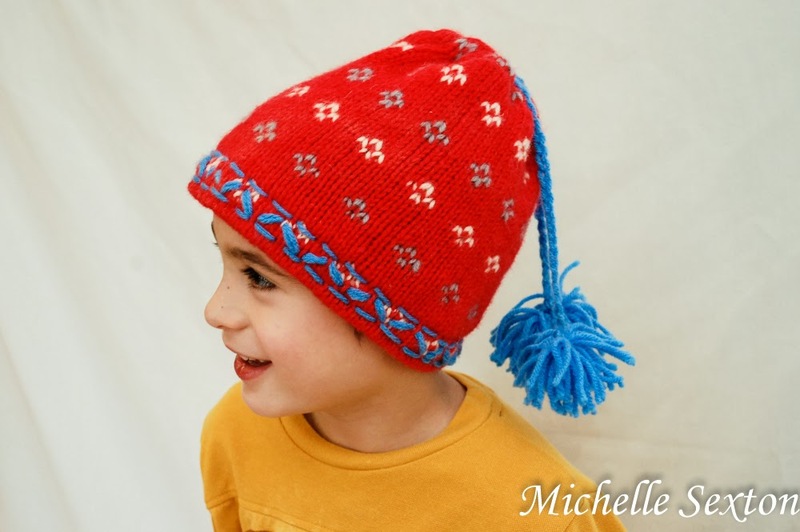 Instead of tossing them, I thought, "Why not make hats for the boys?" Here's the original sweater. It's a hand-knit wool sweater and a bit on the heavy side. 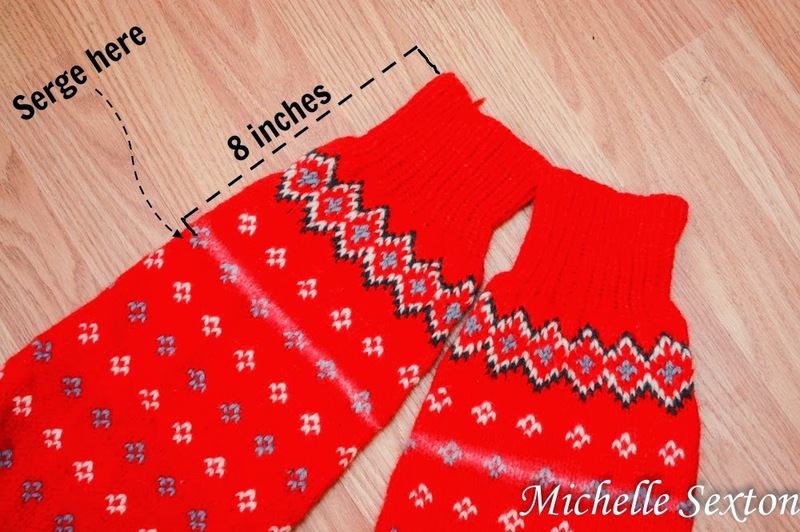 This project is totally doable with the heavy wool sweater, but would probably work out even better on a medium-weight sweater. 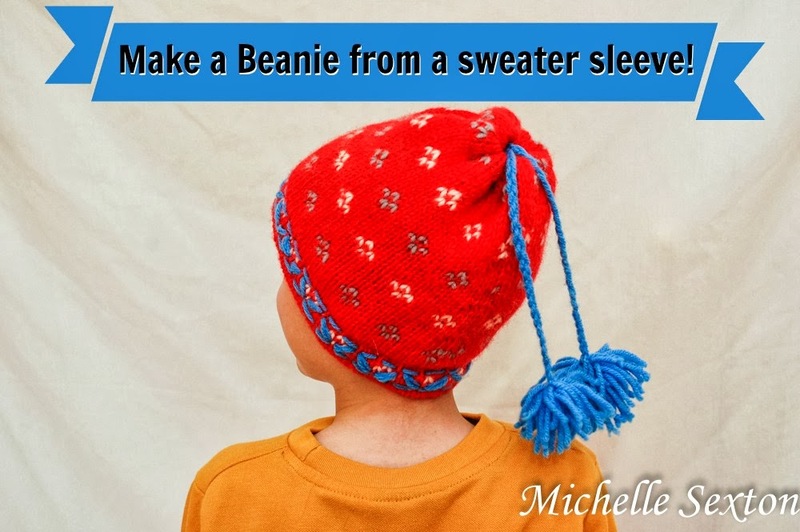 You'll need need at least 12 inches of a sleeve to work with (per hat). 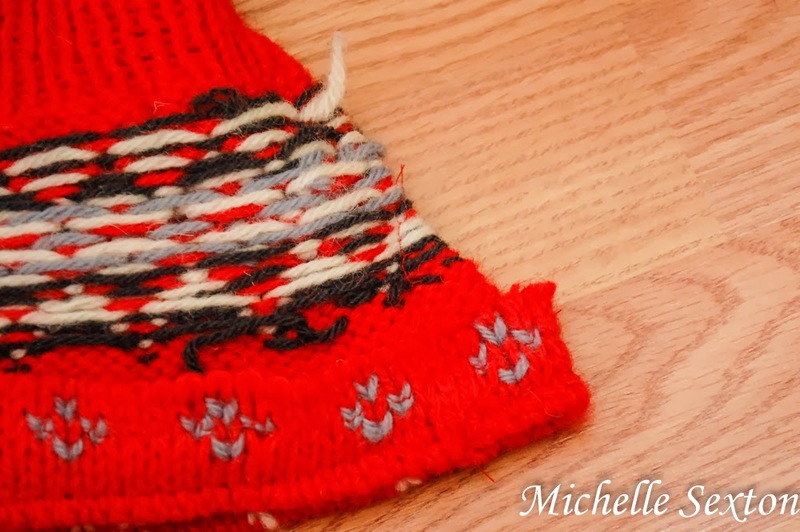 Start out by serging each trimmed end of the sleeve to prevent the sweater from unraveling as you work on it. 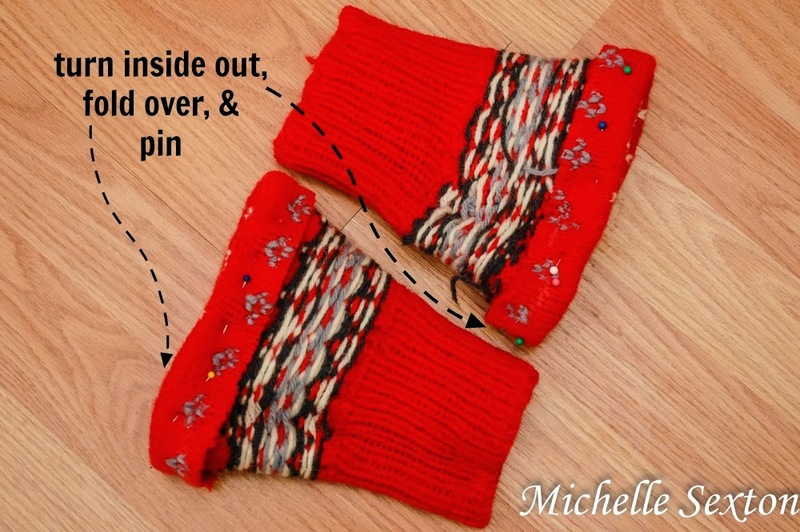 Turn the sleeve inside out, fold one end, and pin it. 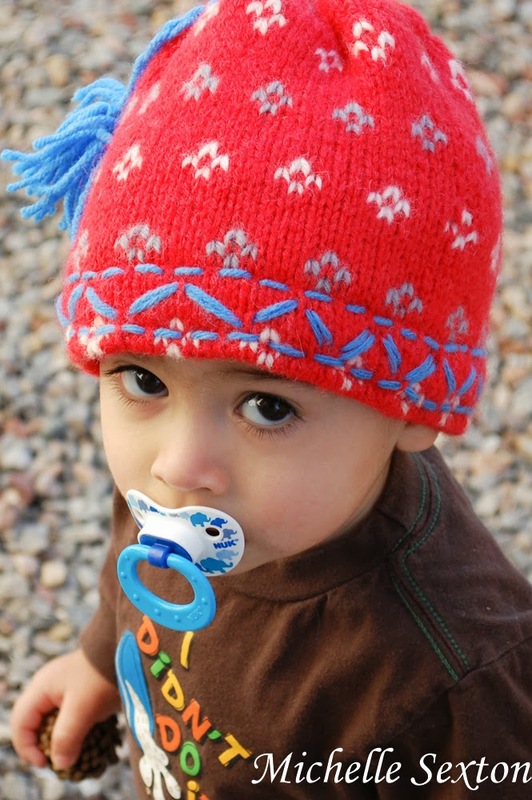 (This is the top portion of the hat. 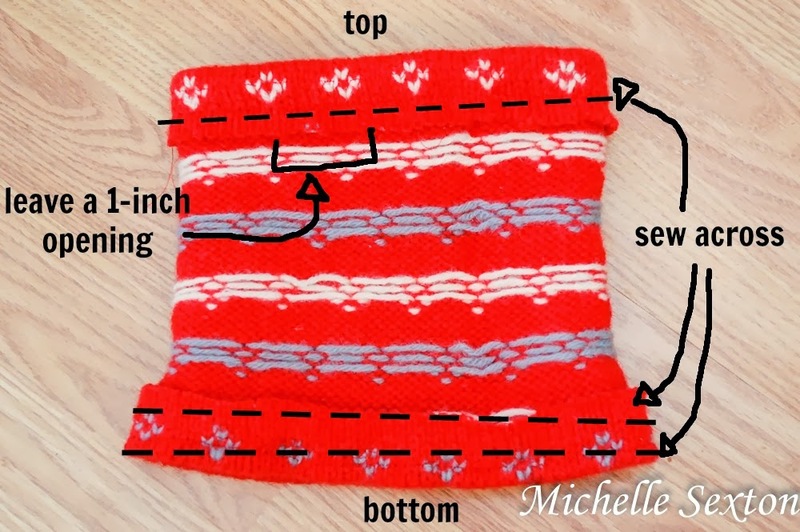 So, if the sleeve has a smaller end, it would be ideal to use the smaller end here.) Side note: the photo shows both ends pinned, but you can pin each end and work on them one at a time. 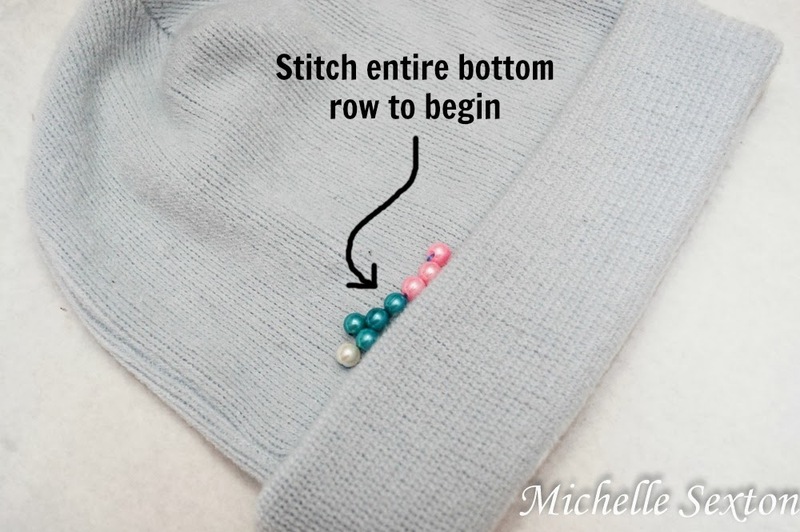 While the sleeve is still inside out, fold the opposite end of the sleeve over, pin, and sew two separate lines over the folded portion. 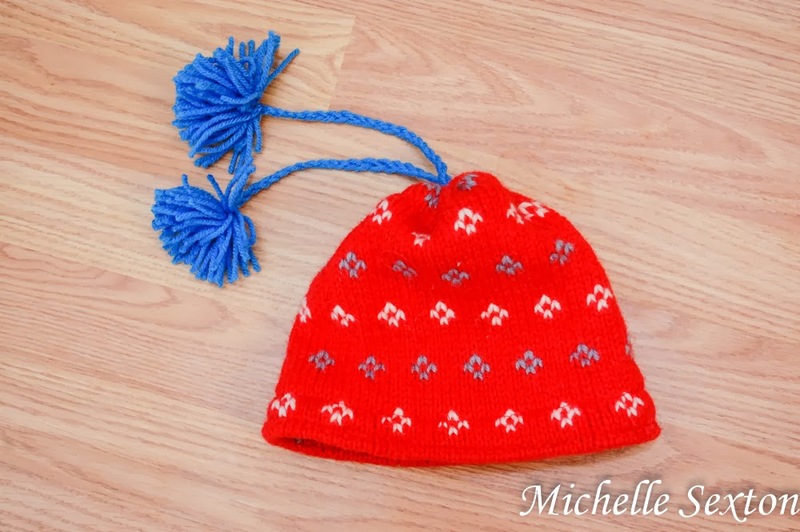 Make one about 1/4 inch above the fold and one about 1 inch above the fold to create a faux brim. This time, make sure to connect the beginning and ending points. Guess what? That's all the sewing needed! For. Real. Gasp! Set aside the sleeve/hat. 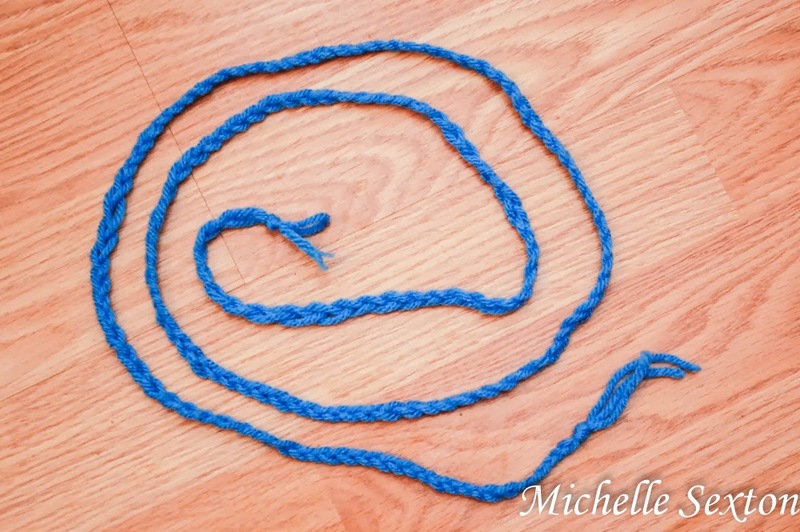 Braid three strands of yarn into approximately the length of 2 feet. Tie one end of the braided yarn onto a small crochet needle. 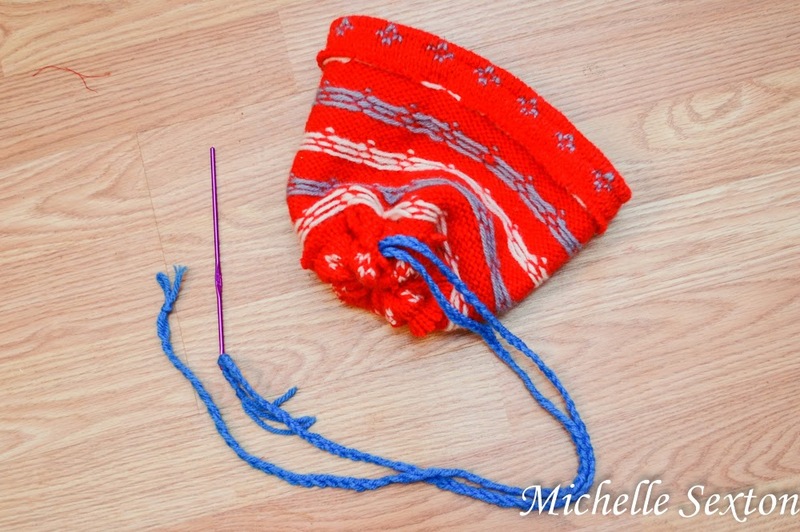 Thread the yarn through the top opening of the hat (the end with the 1 inch opening) and out the other end to create a "drawstring". Pull the yarn tight and tie square knot. 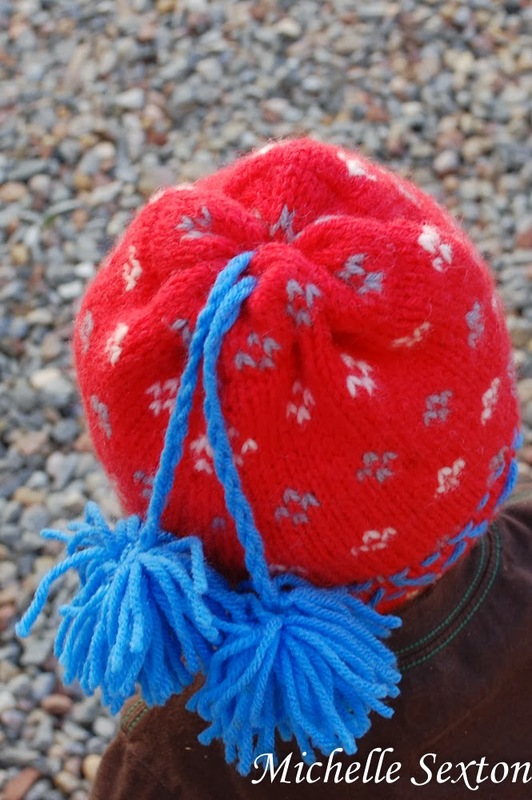 Turn the hat right side out and pull drawstrings through the small opening at the top of the hat. 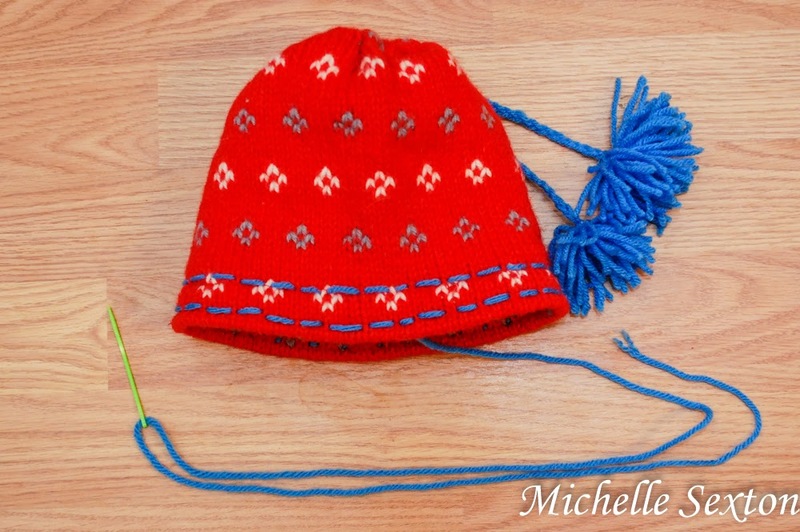 Trim the ends of the drawstrings, leaving approximately 8 inches (or more if you like), and tie off the ends. 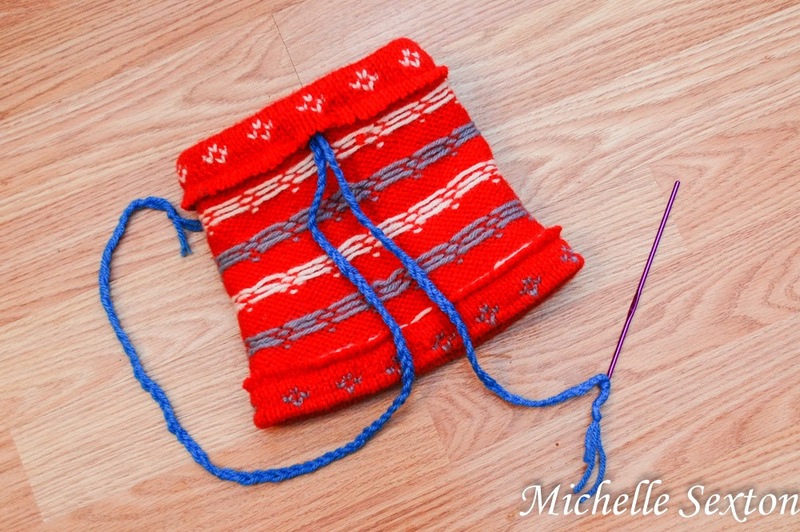 Make two pom poms and attach them to each end of the drawstring. 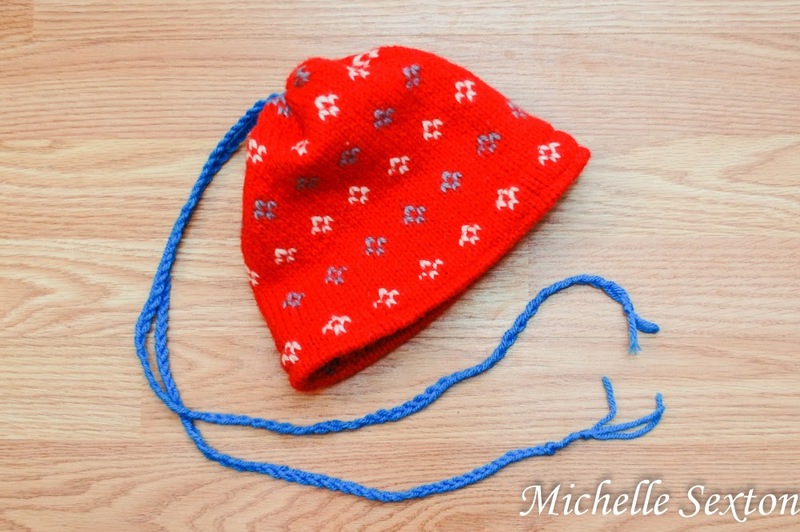 Double threaded a plastic needle with yarn, then "embroider" a cute pattern onto the "brim" of the hat. Wa-La! That's it! Easy-Peasy. 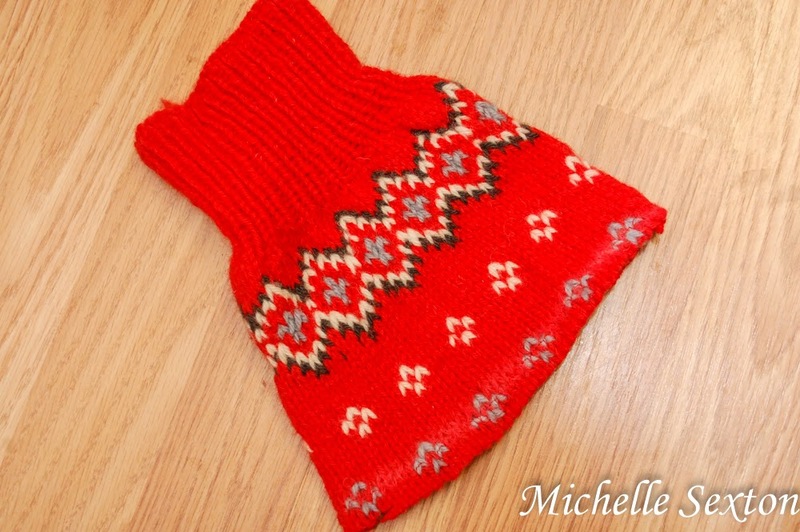 Who would have ever thought to make a hat out of a sweater sleeve?? 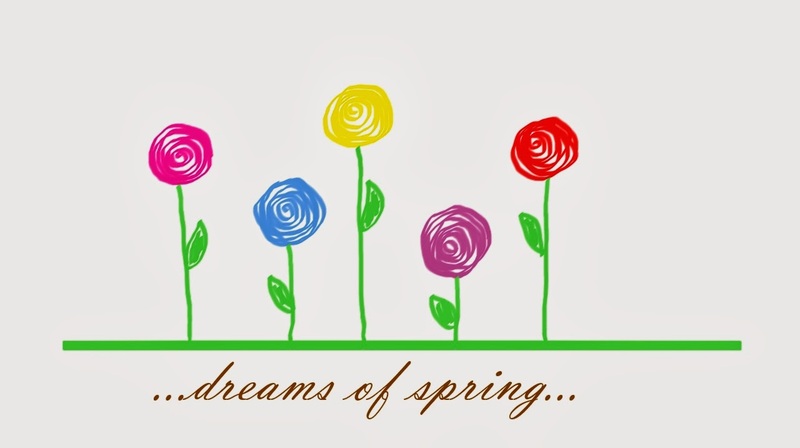 Over the past couple of weeks, I have taken note of several comments, spanning multiple social media platforms, about the anticipation of Spring. Now that the Holidays are over, it seems the whimsical winter wonderland desires have faded, and everybody is ready for Spring. Are you with me? Is anybody else ready for Spring? I am definitely ready for Spring. In fact, to be quite honest, I dread this time of year. It's so uninspiring, cold, and well...boring. 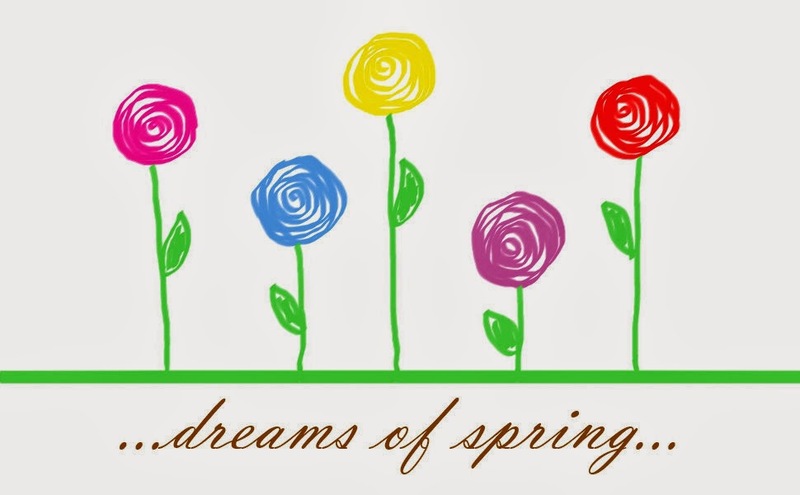 Lately, I've found myself day dreaming about the Spring Season - the activities, the weather, the clothes, so much so that I've even been doodling about it. So, if you're in the same Post-Holiday/Pre-Spring Funk that I've been in, perhaps this will cheer you up and maybe even give you a little inspiration. 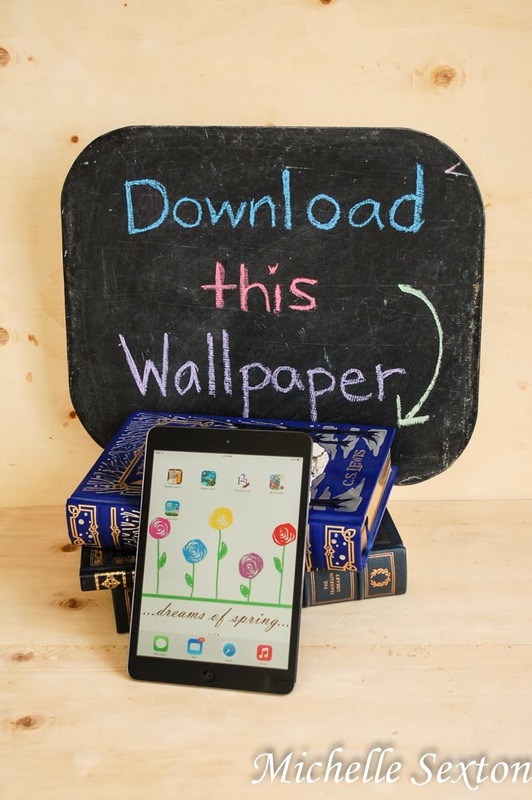 I have a fun, Spring-inspired wallpaper for iPads, iPad minis, and yes, even Android tablets. (We don't discriminate in this household. We use both Android and Mac devices.) Download this wallpaper and remind yourself: Don't despair! 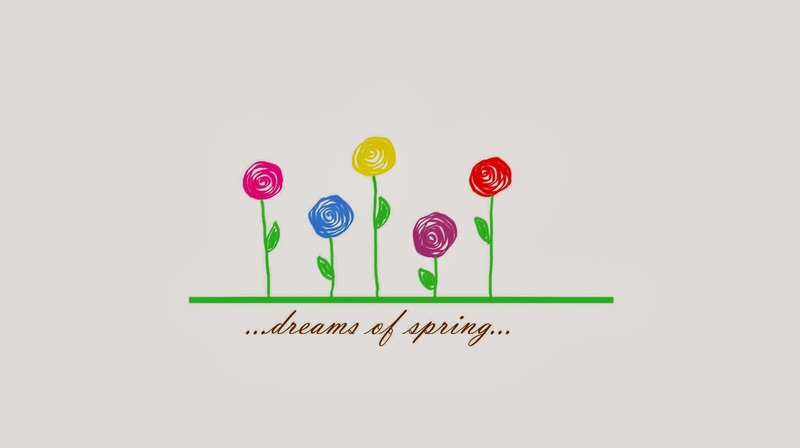 Spring is coming. It's just around the corner. I have a "thing" for upcycling clothes. I've mentioned it before, so I apologize if I sound like a broken record, but I LOVE it. I find it incredibly gratifying to change up an unused article of clothing into something better. I also find it fun to save the unused and discarded pieces for future projects. It's kind of like a game for me...or more like a challenge - "How many different things can I make from this ugly sweater?" The answer? Lots of things! Last week, I shared about how I converted an ugly sweater into an awesome, non-dorky vest...well, at least I think so. Anyway, I saved the sleeves from the sweater and decided to use them for something else - Boot Cuffs. 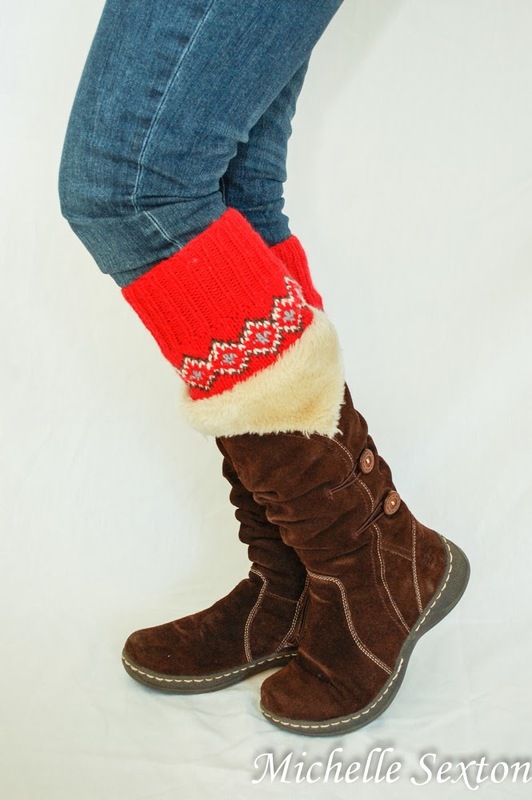 Enter the boot cuffs - the perfect solution for snug fitting boots. 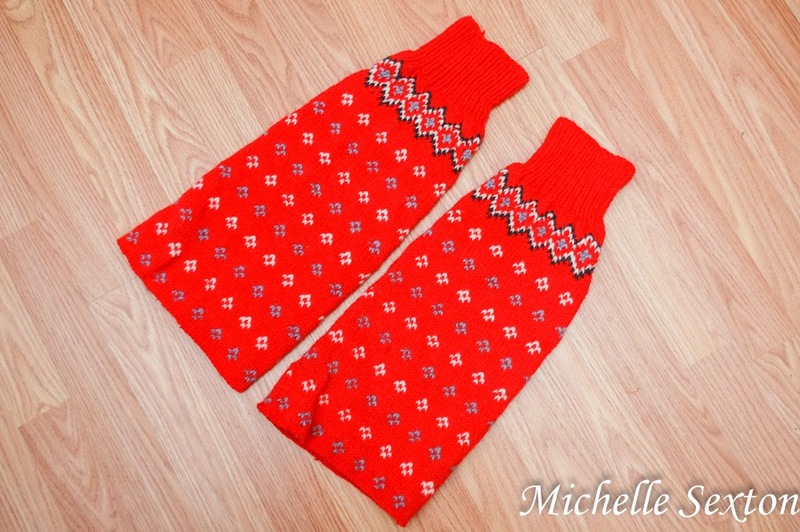 Isn't the whole point of wearing leg warmers to show off the cute "socks" by allowing them to peek over the top of your boot anyway? (Well, aside from the fact that they provide extra warmth). Duh! Why didn't I think of this sooner? I'm going to blame it on the Mom Brain. Yeah. By the way, I forgot to mention this earlier, but this project was so easy, it only took 15 minutes to make. Sssssssssssscore! So, it all started with the sweater. 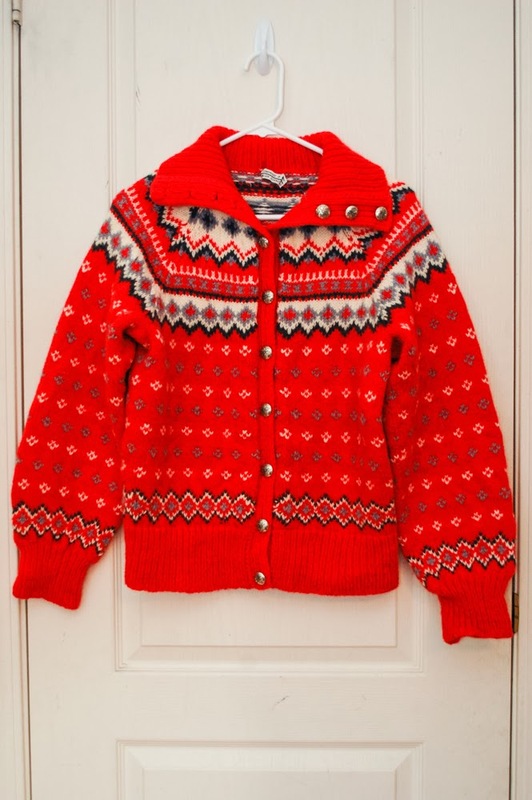 Sweet, wonderful, loud, hand-crafted sweater from Norway. It spoke to me that day in the second-hand store and said, "You know I'm wonderful. I just need a little work. Please buy me so I can reach my full potential." So, of course, I had to oblige. 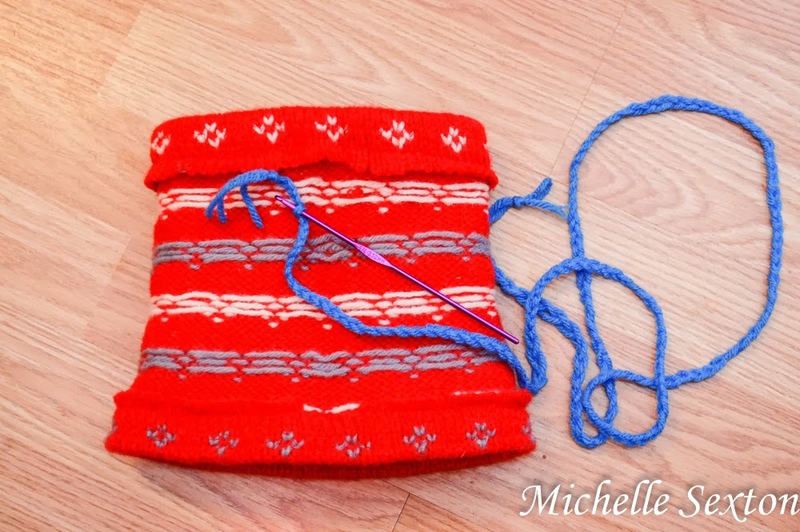 I started out with two leftover sweater sleeves. Starting at the cuff (the portion of the sleeve that sits on your wrist), measure approximately 8 inches down and serge a line completely around the sleeve. Trim off the excess fabric below the serge. 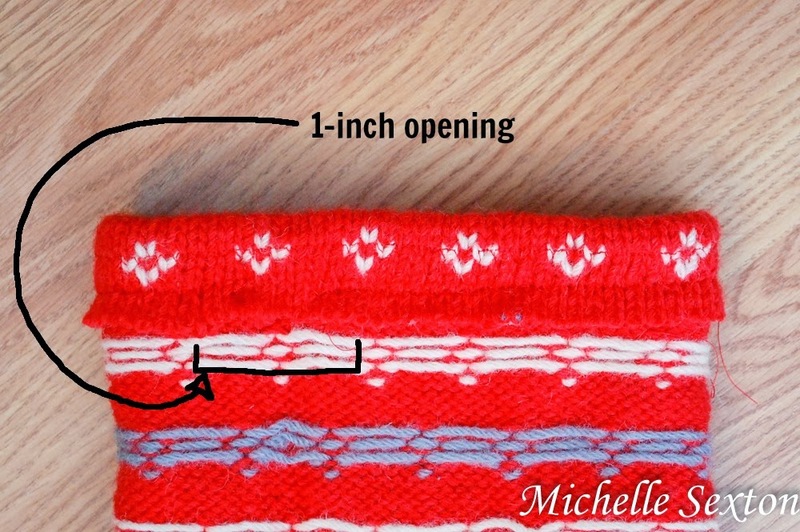 Turn the serged sleeve cuff inside out, fold the fabric, and pin. 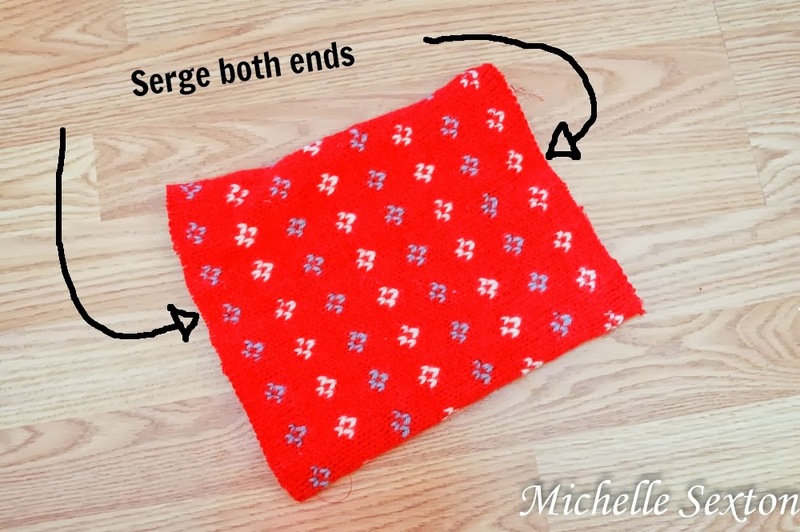 Serge (or use a straight stitch on) the pinned portion of the fabric. Almost done (believe it or not)! 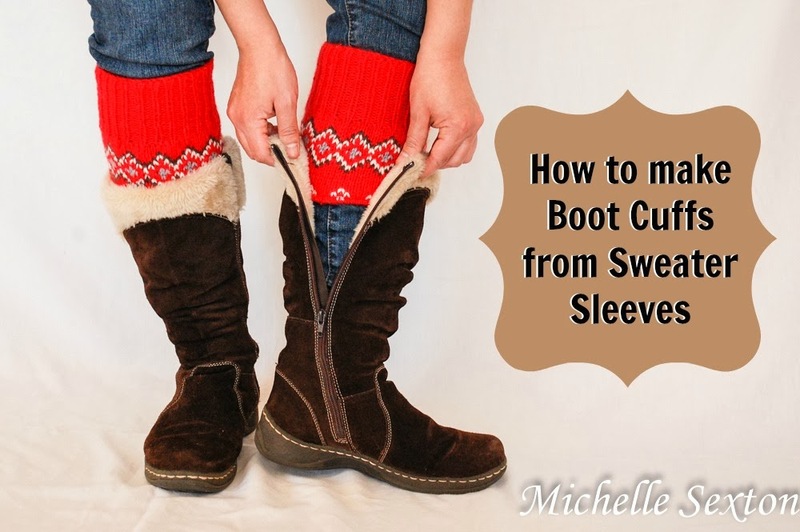 Turn the sewn cuff right-side out and slip it onto your leg, just below your knee. 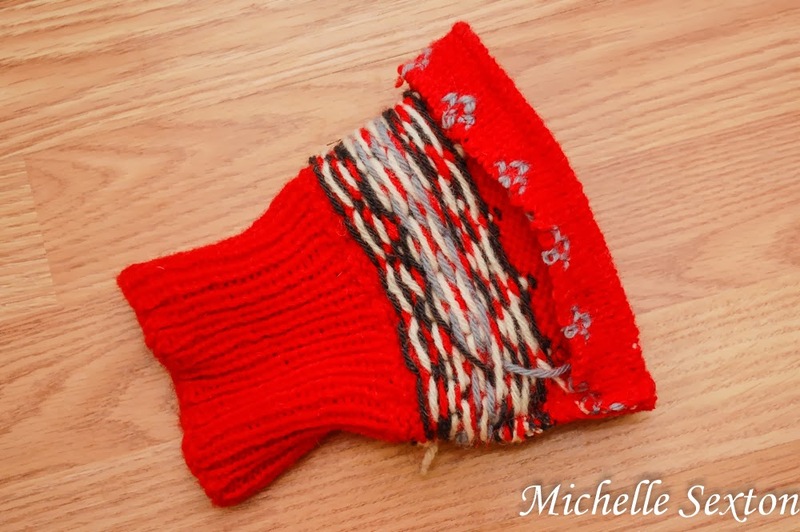 If the cuff fits snugly, breathe a sigh of relief and relish in the fact that you have completed this simple project with very little effort. However, if the cuff came with really baggy sleeves, like mine did, you have one more adjustment to make. Since the baggy sleeves fit loose around my calves, I had to taper the sleeve portion to create a snug fit. While wearing the cuff, get an approximate idea of how much fabric needs to be removed to achieve the desired fit around your calf. Turn the cuff inside-out again and mark the fabric. 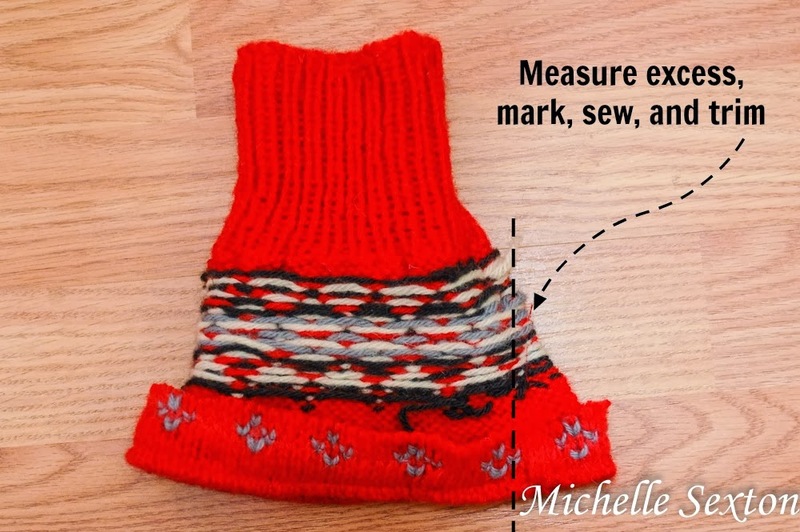 If you like to be precise, you can use a measuring tape and mark off the excess fabric. I'm impatient, so I estimated and marked about a "pinch" of fabric. 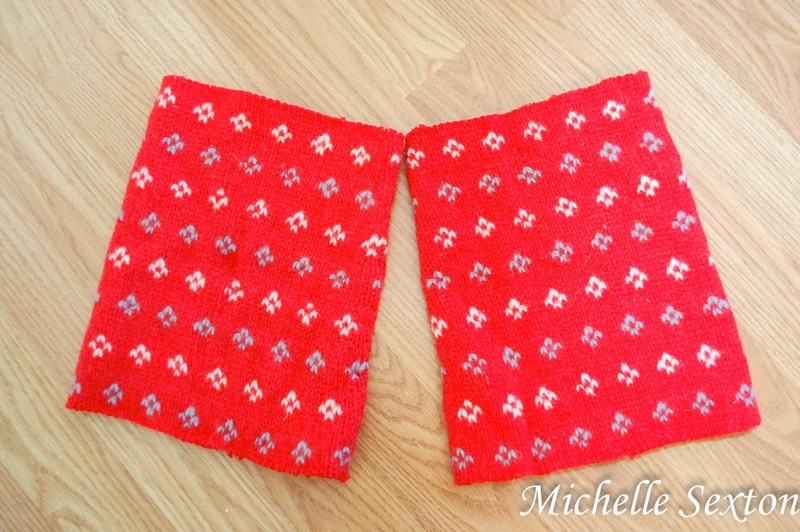 Sew a line down the marked path and trim off excess fabric. Turn right-side-out and wear! That's it, friends! Super quick and easy! If I were to ask you what your favorite breakfast side is, would the answer be hash browns? Yes? I knew it! 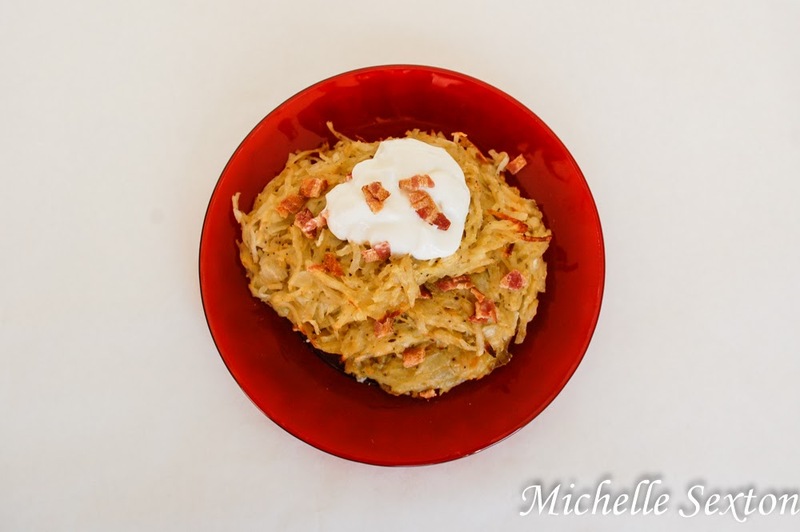 Hash browns are pretty high on my list of favorite breakfast sides...in fact, I'm pretty sure they ARE my favorite side to eat for breakfast. Yes, yes they are, and now I know that you like them, too. So, do you want to make some? (Pshhh...like I really have to ask! I KNOW you do.) 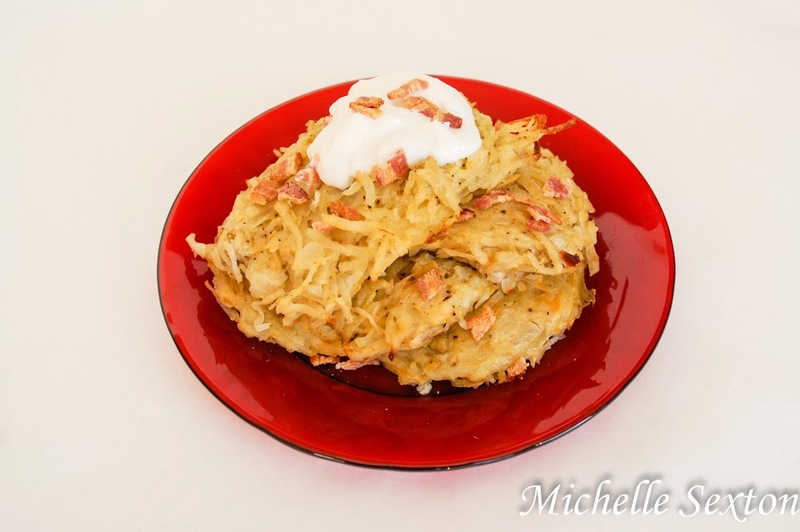 I found an awesome upgraded recipe for hash browns to share with you. These aren't your typical hash browns. Instead of frying the life out of those grated potatoes (and adding waaay too much grease), we bake them! They're not as crispy as the fried version, but these hash browns are still firm, non-soggy, and extremely satisfying, you won't even miss the crispies. 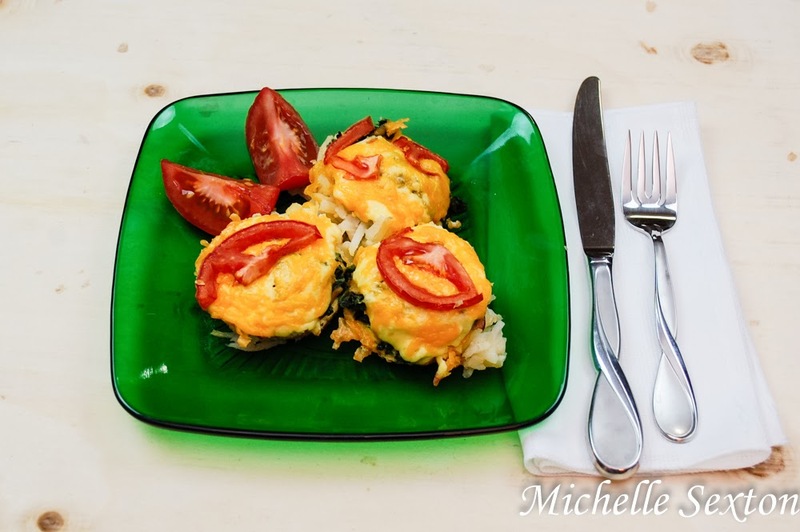 They have several bonus ingredients in them: onions, garlic, cheddar cheese, and even eggs! What? Oh, yes they do. But wait, there's more - the coup d'etat of this dish is a hint of sour cream and bacon to top off these baked hash brown patties. What more could you ask for? Nothing, really. Heat olive oil in a medium non-stick skillet. Add onion and cook over medium high heat for 5 minutes, stirring occasionally. Add garlic and cook for 2 minutes, stirring frequently. Remove from heat and allow onion mixture to cool for 5 minutes. Combine onion mixture, grated potato, cheddar cheese, salt, black pepper, and eggs in a medium bowl, stirring well. Put pre-cooked bacon on a plate lined with paper towels and heat for 40 seconds or until crisp (assuming the bacon needs to be reheated). Set aside. Divide the potato mixture into 8 equal portions and shape each portion into a 1/2 inch thick patty. Place the patties on a baking sheet coated with cooking spray. Coat tops of patties lightly with cooking spray. Bake at 425 degrees for 15 minutes. Flip and cook another 10-15 minutes on the other side (or until patties are dark golden and set). Top with crumbled bacon and sour cream. By the way, I found this recipe on the Shrinking On a Budget website.